After many months of refinement on the alpha versions, Gallery 1.6 Release Candidate 2 is here. This is the second of at least 2 Release Candidates before Gallery 1.6 will be release and recommended for production sites. A release candidate helps users like you test out new features and provide feedback so that the final version has as many possible issues resolved. Please notice that while this release comes with some great new features (e.g. Group Support, Captcha), it contains incompatible changes with older versions of Gallery 1. This release introduces large changes to CSS and layout, which are incompatible with any previous Gallery 1.x installation. None of your modifications of your Gallery 1.5.x will work in Gallery 1.6! You can of course use your current albums and photos etc, but we suggest a fresh install and then port your mods over. We encourage you to try it out and report any problems you have because the more people who give us feedback, the better the final product will be. You can get Gallery 1.6-RC1 from the download page on SourceForge. This release also includes the same security fixes as Gallery 1.5.8 and Gallery 1.5.9 so if you are using one of the Gallery 1.6 alpha releases or first release candidate, we highly recommend that you upgrade to Gallery 1.6-RC2 to protect your installation. After many months of refinement on the alpha versions, Gallery 1.6 Release Candidate 1 is here. This is the first of at least 2 Release Candidates before Gallery 1.6 will be release and recommended for production sites. A release candidate helps users like you test out new features and provide feedback so that the final version has as many possible issues resolved. Please notice that while this release comes with some great new features (e.g. Group Support, Captcha), it contains incompatible changes with older versions of Gallery 1. This release also includes the same security fixes as Gallery 1.5.8 so if you are using one of the Gallery 1.6 alpha releases, we highly recommend that you upgrade to Gallery 1.6-RC1 to protect your installation. While these security fixes are not in our public source code repository prior to the release, we will begin adding them to it as soon as possible once this story is posted. Gallery 1.5.8 is now available for download. This release fixes many security issues including some serious security issues. It also resolves as well as a handful of bugs and reorganizes the internal API some (which is documented here). We strongly recommend that all users of Gallery 1.5.7 and earlier upgrade to this release to protect your Gallery installation. You can download Gallery 1.5.8 from the Gallery 1 download page on SourceForge. Upgrade instructions are available on our documentation site. Please discuss any issues specific to this release in this forum thread. Gallery 2.3 RC1 is now available for download! This is the first of two release candidates before Gallery 2.3 will be complete. A release candidate helps users like you test out new features and provide feedback so that the final version has as many possible issues resolved. We have 6 different packages for you to choose from. You can read all about it on our Gallery 2 Download Page. As always before you ask for help, please, please read the README and the installation docs -- we've made an effort to answer all of your questions there. Also consider looking at the known issues. Upgrading is quick and easy. There are a few things you should know first so be sure to scan the upgrading instructions. Then head on over to the Gallery 2.3-RC-1 Forum Topic and let us know what you think! 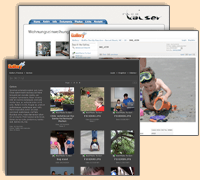 Gallery has several printing affiliates, but many of them are in the Unites States. fotokasten is based out of German and provides our European Gallery 2 admins a way to make money off of their websites. through their free "Partnerprogram." Below is their story about their service and their current promotion! Gallery 2.2.5 is now available for download. This release fixes critical security issues, no new features have been added. Users of all previous Gallery 2 versions are strongly encouraged to upgrade to version 2.2.5 as soon as possible! All issues addressed in this release have been discovered in internal security audits. Since 2.2.5 is a security release, it shares the same installation requirements as 2.2.4. If you haven't upgraded to 2.2.x yet, please review the Gallery 2.2 release notes for highlights of changes and the requirements. Read on for more details and upgrade instructions.